Gain continuous visibility and real - time management of changes — Protect critical system, configuration, and content files across distributed and remote locations by enabling instant change detection and providing sophisticated alerting mechanisms. Prevent tampering with critical files and registry keys — Enforce change policies and block all unauthorized changes, whether attempted maliciously or in error. Fulfill PCI DSS regulation requirements — Change Control File Integrity Monitoring (FIM) software lets you validate PCI compliance in real time. It includes out-of-the-box FIM rules that make it easy to get started, and includes QSA-friendly reports for simple PCI reporting. Prevent change-related outages and delays — Block unauthorized changes, while emergency fixes and other out-of-process changes are automatically documented and reconciled for easier audits. Get rid of resource-intensive compliance policies — Eliminate the need for manual, error-prone, and resource-intensive compliance policies that are often associated with SOX mandates and other regulations. With McAfee Change Reconciliation software (optional), Change Control lets you build an automated IT control framework in which all the information required to verify compliance is available in a single reporting system. Gain centralized change management — Change Control integrates with McAfee ePolicy Orchestrator (McAfee ePO) software for centralized IT management. Changes in server environments are constantly taking place in many organizations today—and going undetected. It’s a situation that is dangerous, both in terms of security and compliance. McAfee® Change Control delivers continuous, enterprisewide detection of authorized changes as they occur. It blocks unauthorized changes to critical system files, directories, and configurations while streamlining the implementation of new policies and compliance measures. Gain continuous visibility and real-time management of changes to critical system, configuration, or content files. Prevent tampering with critical files and registry keys by unauthorized parties. Fulfill the PCI DSS regulation requirement for file integrity monitoring system. Easy to get started with out-of-the-box FIM rules. QSA-friendly reports for easy PCI reporting. One-click exclusion feature to avoid tracking irrelevant information. Tight policy enforcement via proactively blocking of out-of-process and unwanted changes before they occur. Integrates with McAfee® ePolicy Orchestrator® (McAfee ePO™) console for centralized IT management. Comply with PCI DSS requirements with the Change Control File Integrity Monitoring (FIM) software, and continuously track changes to file and registry keys and identify who made changes to which files. Protect critical system files, directories, and configurations from tampering with Change Control’s Change Prevention software. No changes to the server environment are permitted unless they are in accordance with set policies. Use Change Reconciliation software (optional) to integrate Change Control with enterprise management systems through McAfee ePolicy Orchestrator (McAfee ePO) software. Change Reconciliation software includes single-click integration with BMC Remedy. Enjoy negligible impact on server performance. Memory usage is low, there is no file scanning to affect system performance, the software is easy to set up, and its operational overhead is minimal. File integrity monitoring—Continuously tracks changes to file and registry keys and identifies who made changes to which files. Change prevention—Protects critical files and registry keys from tampering, with changes only permitted in accordance with update policies. 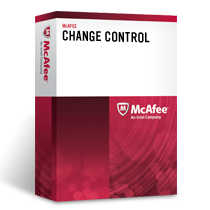 McAfee Change Control software eliminates change activity—which is far too common in enterprises today. Change activity can lead to security breaches, data loss, and outages. Featuring file integrity monitoring, and change prevention, McAfee Change Control enforces change policies and provides continuous monitoring of critical systems. It also detects changes made across distributed and remote locations and blocks unwanted changes. With its intuitive search interface, McAfee Change Control helps users quickly home in on change event information. For example, you can query the interface for data on all changes that occurred in the c:\windows\system32 directory that were made on the server xyz.acme.com. PCI DSS Requirements 10 and 11.5 call for tracking and monitoring all access to network resources and cardholder data and deploying file integrity monitoring (FIM) tools to alert personnel to unauthorized modifications of critical system, configuration, or content files. McAfee Change Control enables you to implement real-time FIM software and validate PCI compliance in an efficient, cost-effective manner. McAfee Change Control FIM provides the who, when, what, and why essentials. It gives you the user name, time of change, program name, and file/registry content data all in one place and in real time. In addition, it can help you identify root causes when troubleshooting in the event of an outage. McAfee Change Control allows you to track file content and attribute changes. File content changes can be viewed and compared side by side to see what was added, deleted, or modified. This is handy while troubleshooting configuration-related outages. Include/exclude filters can be configured so that only relevant, actionable changes are captured. What’s more, special alerting mechanisms instantly notify you of critical changes, so you can prevent configuration-related outages—a recommended information technology infrastructure library (ITIL) best practice. Qualified security assessor (QSA) forms are provided for easy PCI reporting. 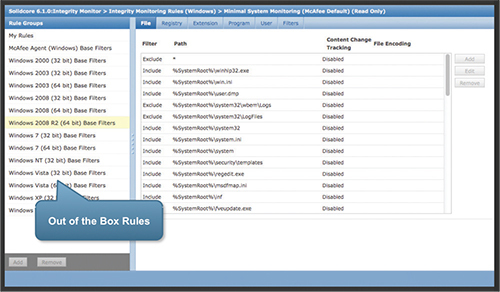 McAfee Change Control features out-of-the-box FIM rules and sophisticated filters for monitoring only relevant files. McAfee Change Control allows IT to easily resolve incidents, automate regulatory compliance controls, and prevent change-related outages. Additionally, McAfee Change Control eliminates the need for manual, error-prone, and resource-intensive compliance policies that are often associated with Sarbanes-Oxley (SOX) mandates. McAfee Change Control enables you to build an automated IT control framework in which all the information required to verify compliance is available in a single reporting system. Changes against authorizations can be validated automatically. Emergency fixes and other out-of-process changes are automatically documented and reconciled for easier audits. McAfee ePO software consolidates and centralizes management, providing a global view of enterprise security. It gives you the flexibility to adjust the types or scope of systems to cover and lets you determine which files, directories, and configurations should be included in change alerts, as well as the priority of alerts. Default profiles developed for most common types of server operating systems and enterprise applications are available to monitor for critical components without creating new ones from scratch. With McAfee Change Control and McAfee ePO software, new profiles can be activated at any point in time to increase protection—from simple monitoring to bulletproof enforcement. McAfee ePO software is scalable and readily extensible. It integrates McAfee Change Control software and other McAfee security management products with those of McAfee Security Innovation Alliance Partners. McAfee Change Control software tracks and validates every attempted change in real time on your server. It enforces change policies by requiring that changes be made within a time window, only by trusted sources, or with approved work tickets. The change prevention component of McAfee Change Control software can be finetuned to allow native applications to update their files continuously without interruption, while disallowing all other applications or users from making changes or even reading specified files. McAfee offers a wide array of risk and compliance solutions to help you minimize risk, automate compliance, and optimize security. In particular, McAfee Change Control and McAfee Application Control are a powerful combination for eliminating vulnerabilities and ensuring compliance throughout the enterprise. McAfee Change Control software eliminates change activity in server environments that can lead to security breaches, data loss, and outages and makes it easy to meet regulatory compliance requirements. Prevent unauthorized changes while automating regulatory compliance controls with McAfee Change Control today. Easy setup and low initial and ongoing operational overhead. No file scanning that could impact system performance. Download the McAfee Change Control Solutions Datasheet (PDF).